Lives aboard what ? – Dirty wet dog , boats and sailing. This is the third post in the liveaboard series that i am writing for the preparadness/self reliance community and website. In this post i finally get to talk about some examples of the hardware….the actual boats that people have lived aboard and do live aboard. First though i want to put this in the context of my own data-searching : asking the question “how many people live aboard boats”, where do they live and what kind of boats do people live aboard anyway ? One of the interesting things i came across when i was doing my long internet boat search recently for example was that several of the boats that were in my search bracket had been, or were being live-aboard boats. Before i begin the actual post though i want to start with a thread response from one of my regular readers , this being in response to one of the previous live-aboard boats post : principally about canal/inland boats. Right now, some 4 weeks into the researching for this series and having watched countless video’s about the life of inland boaters i feel as though i have had the experience of ‘enjoying’ Vogon poetry…..sat here strapped securely to my Vogon poetry appreciation chai, gagged and lightly sedated…..except in this case its the very material that has been like a slow-drip sedative. I have honestly watched my way through several different inland boaters youtube efforts and quite seriously it’s all blurring into one mediocre mess of same-y almost nicenesss. Its as though a whole bunch of retired council officials, low grade middle managers and the nice couple from down the road (canal) all got together to produce the most boring committee film ever….with nice tea and cakes in the interval of course. I have worked out the plot-line of just about every canal boat based Vlog and it always involves some ‘nice’ countryside that is actually quite flat and boring because canals don’t go through the really hilly bits, some ‘nice’ wildlife…the obligatory swans, cute ducks and cows….lots of cows. It all seems to start and end outside somewhere completely forgettable : from little dribbling to greater snoring perhaps with a couple of locks in between and always finishing with a nice shot of ducks and a ‘nice cup of tea’. Ok….incipient tourettes-esque rant over with….. Even after quite a long search i can’t find accurate data but the numbers that i have found are quite surprising, one estimate is that over 10.000 people live aboard boats/watercraft in the London area alone and a few years ago there was a conservative estimate of 22,000 living on the inland waterways. I don’t know of any similar estimates for people living aboard sea going sailing or motor vessels although i think that the number is less than a tenth of the inland estimate. That’s purely from my own observation and experience by the way. There is then a breakdown of what types of boat people are living on along the inland waterways, many or most seem to be ‘narrow’ boats of varying length or their generically similar ‘widebodies’ boats (i will come back to that shortly). After that there are the boat conversions from working craft…..ex fishing boats, tugs, ex military craft and so on in decreasing numbers. Here for example is a former fast patrol boat now doing service as a houseboat : i initially thought that this was the famous local ‘S’ boat but isn’t although it did donate it’s engines to that project. This one , like many others, doesn’t really count as a boat any more , at least in my mind, because it has lost the ability to move. Also like many other conversions it’s a visual mess . Anyway, lets start today with a quick run down of the more typical inland waterways boats, especially the narrow and wide canal boats that are the most common liveaboard boats on the canals. This mainly breaks down into 2 specific widths of boat that relate to the maximum width and length of canal locks. If i have got this right then the older/earlier canals usually have a maximum standard lock width of 7 feet so any boats that want to cruise the entire system have to be around 6′ 10″ or slightly less. There is also a maximum practical length for cruising the entire Uk canal system of around 56 feet and on top of that limits for maximum water draft and air draft….how much boat is in the water and how much can go under every bridge and tunnel. As an aside here i played around with the idea of bringing my sailing boat back across the Uk canal system via the Thames and tried to work out whether my 7′ 2″ beam sailing boat would do it….the answer is that it might and could be an interesting winter project if i cruised around the south and south-east coats first. In his channel he goes through the entire process of finding his boat, moving aboard, learning to drive it and so on. This next channel i think has a nice look at a shorter boat of around 40 feet and is a pretty good look at the kind of living space you can expect at this next size down. This one is slightly historical for me in that it starts in the Sheffield canal basin, i lived very near to there at one time and this where i would have had to start my ‘city exit’ (bug out) from. So : video 1 and i believe an honest look by the cruising cut guy about the realistic price to get decent boat on the water , from his searching of brokers and magazines he reckons on upwards of £30k and more like £40-50k and ok…it’s a home but that does seem an awful lot of money for what is a very basic structure and fit-out even secondhand. What my own readers will be aware of is that we did an exercise on the blog to try and find sailing boats at a budget. I for one sail on a micro-budget, one wing…and several prayers…so we started that search with about the same budget as my boat cost me : around 5 grand. As i remember it we than halved the budget to see what we could find and even took it down to a thousand pounds just to see if we could find a boat with the basics in place and a small cabin at that price…and we did. We then doubled the initial £5k budget and looked at the £10k price range and we found many capable sea-going boats in that range. So at the outset here we seem to be generally working on much smaller budgets and i do know of several actual live-aboard sailing boats at less than the original £5k budget. So…lets take this into the realm of the possible with small sailboats that people have lived aboard. I may have told this story before but my first experience of this was a couple of years into the time i spent working at Dickies boatyard in Bangor north Wales. At the time i was only that same time into my own sailing life which started and finished with some version of a twitchy IOR cruiser-racer. 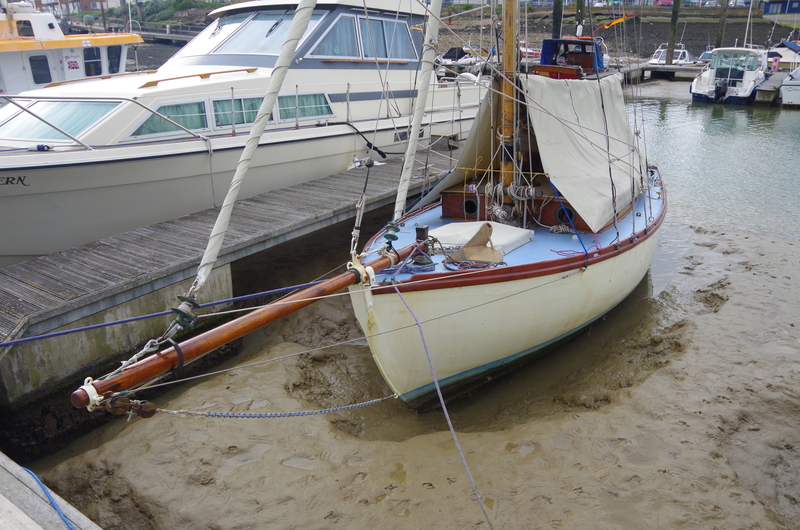 In simple terms i knew very little about boats….just enough to know how to scrape and scrub a bottom and get a mast in and out. Anway, this one time i was detailed to go around to Port Penryhn which is just across the bay and hoik the stick out of a little wooden gaffer very much like the one i bought , sailed and sold on this year. The boat would have been about 22 feet or less and had been sold which was why we were taking the mast out and getting ready to lift the little gaffer out onto road transport. I had a chat with the owner who must have been about my age now and was even scruffier than i can be on a good day, i’d seen him about locally and he had even been to my workshop to have galvanised wire stays made up. He said that after about 5 years of living aboard the boat he was selling it to buy a ‘much larger boat‘ and when i asked him about that he said that the new one was all of 26 feet and would have a separate cabin to sleep in. What i worked out from that was the small space that i had just been working in to knock the mast wedges out was his entire living space. Unlike my own gaffer there was only one bunk/settee and the other side of the boat was set up with a cupboard, a galley work-top with, i think, a primus stove and then a wood/coal burning stove much like my little pansy stove. I remember actually being shocked at the time that someone could live in such a spartan little space although he seemed content ….years later i was very much reminded of him and his little boat when i lived aboard Inanda during my voyage with her. Today i have some experience with small boats and a lot more experience of living in small poky flats and bedsits….many of which i would class as a lot less pleasant than living aboard even a minimal sailboat. Not so long ago i was talking to a local mate of mine who said that he had lived aboard one of these for a while and these boats are even smaller inside than my chunky little gaffer. This is of course the popular little Corribee design, a couple of weeks back there were 2 of these on ebay at about the thousand pound mark. Now the Corribee is too small inside for me, actually too low, but for a young person and maybe a petite one this has been shown to work. Lets also add that at least one of these has been across the Atlantic and up into the Arctic. My version of a very small boat in the same kind of bracket would be the Achilles 24…..and once again i i know of one that has served as a temporary home and another one that does long voyages. My last story of the day features a small boat very much like a 21 foot Corribee, i still haven’t been able to work out what the boat actually was and the nearest thing i can find to it is the little sloop on the mooring near to mine own. A good sense of size and scale is given by the pilot gig rowing down the river. I reckon the little sloop is about 22 feet, doesn’t have an inboard engine and does look ‘salty’. Well….the story here is that a few years ago i kept meeting a boat like this one, although he had a comically large windvane on the back, everywhere that i went with my ‘big boat’ (Frances 26). I met him locally at anchor in the lynher….then down in Falmouth and then again several places in western and southern Brittany and it was only then that we got to speak. The owner i reckon was easily in his 60’s and he said in a near-permanent live-aboard and cruising stance with that little slooop. When i last saw him during that cruise he said he was heading up the Aulne with a plan to over-winter there next to the quay. A quick search on ebay and several brokers will find a dozen small and capable boats like this and most of them for much less than £5,000. Where now the £40-£50.000 live-aboard ? For the very last part of this as i really need to wind this up today i am going to do a quick run through of some of the small sailing boats that i know have been used as live-aboard boats. The Corribee i have already mentioned as that was a mate of mine, a slightly larger boat is one that i saw when i was based in Falmouth last year and not much larger than my own. There happens to be at least one of these on Ebay right now. This is a Newbridge boats ‘Virgo Voyager’ slightly longer than my little boat but just enough larger all round to allow a more practical micro-home. One of these would do the same job as my boat does albeit with a slight draft restriction. Slightly larger is one of 2 Macwester 26’s and 27’s that came up on a recent search. One of them was advertised as having been used by it’s owner as a live-aboard, once again in a Falmouth marina. The one i have highlighted here isn’t the one that i saw advertised as having been a live-aboard (already sold i believe) but there are several of the same class on the market right now. This is a slightly scruffy but ‘do-able’ one. At this size the living space is starting to become a lot easier to deal with because what that size allows is a separate sleeping space, a workable galley and somewhere to sit comfortably and work. My own choice at a very similar size would be the Rossiter Pintail which is on my actual list. Again this isn’t the actual boat but the same class as the one for sale over in N.Wales right now and on the hot list. In terms of actual money a bare-bones Corribee would come in at less that a thousand pounds, there are several Virgo Voyagers on the market at the £2-3,000 mark and the one Rossiter at just over £6.000. Previous For every problem a plan. Next This year in sailing : part 1. Fame at last 😉 Another enjoyable and informative read — cheers Steve. I know what you mean about Vogon poetry appreciation but I just can’t seem to quit watching it on Youtube. The channels you linked to are coincidentally my favourite poison. Beats sleeping pills any day (or night) of the week. Living in a caravan in N. Wales sounds awfully familiar….my one was up in the wilds of Mynydd Llandegai and that was in the 70’s too…..horrible place.